One of the dishes I always look forward to is steak. It used to be a treat whenever we have an occasion or achievement to celebrate. But now, it has become more of a casual treat to cap the week or simply to satisfy my cravings. And with my insatiable craving for good steak, I'm always on the look out for places to get some. Lately though, I discovered that you could also have good steak at home. I find it fascinating how restaurants brim with pride whenever they claim that their steaks are from Snake River Farms (SRF). I used to be passive about it since I was more interested in taking a bite of the steak they were about to serve. But there's more to the brand that makes this meat different from the rest. If you've come across my Alternatives Food Corporation article, you'd be more familiar with SRF. I've had the pleasure to get hold of some SRF's meats a few months back and it was nothing but pure joy to have superb meat at home. Each bite was tender and unlike Japanese wagyu, it had beefier taste. Its superb taste and drool worthy texture could be attributed to how this family-owned business operates. Its head Robert Rebholtz, Sr. has been very hands on from the ranching down to feeding, beef processing, marketing and sales ensuring that the business provides top quality meat in the market. The result is having its meats far exceed industry standard. I guess you could call this as the beef industry's version of "hand-crafted". 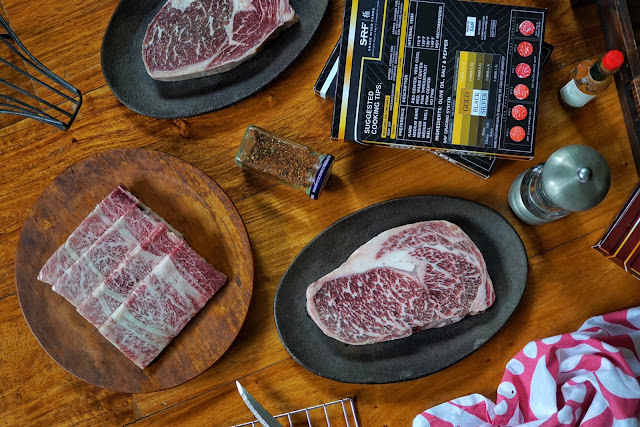 Known as American Kobe beef, it is the brand of choice of notable and world-renowned chefs, beef connoisseurs and numerous Michelin-starred restaurants worldwide. You could tell too here in Manila where this brand is used by some of the best establishments and hotels in town. SRF's cattle are raised along the high plains of the Snake River in Eastern Idaho which allows access to some of the finest feed ingredients. Also, SRF adopted several aspects of Japanese feeding method which are far longer than the traditional U.S. cattle production methods but yields far better meats. I was able to indulge in its Black and Gold Grade Wagyu a few weekends ago. Having both meat grades side by side helped me compare one from the other. So what's the difference? Aside from Gold Grade being more expensive at PHP1,699 per pack (approximately 320-350 grams), you'd notice the difference in marbling. Gold has more marbling (or fat) than Black Grade (priced at PHP1,499 per pack, approximately 320-350 grams) giving the the former a more tender texture or bite and beefier taste. We all preferred Gold over Black though as it was more tender. 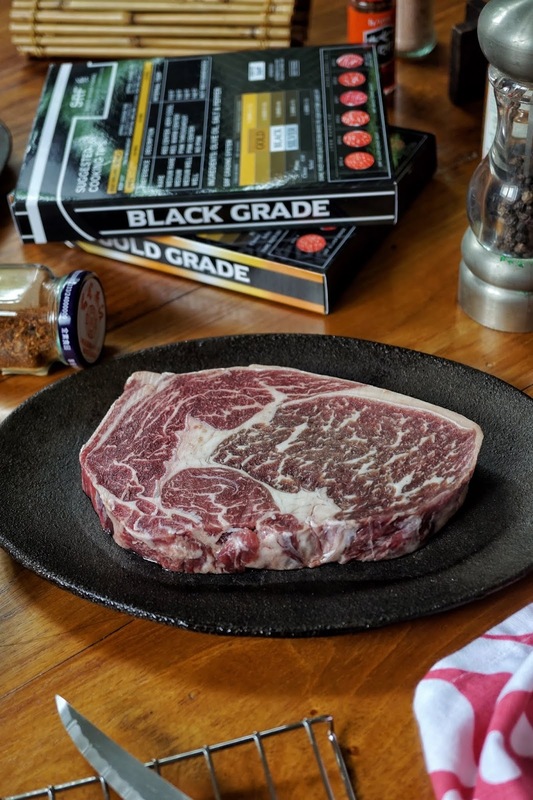 Don't get us wrong though, the Black Grade Wagyu is good too. It is also tender and have that delightful beefy flavor. Just check out that marbling! However, Gold Grade surpasses it in all aspects. Another steak I was able to feast on that weekend was Omi Wagyu A5 Chuckroll (PHP2,599 per pack). It has lighter flavor and it was a lot more tender. But don't think that this is a bland piece of meat as its mouthwatering aroma fills the room as soon as it hits the grill. It is best to enjoy these great meats with rock salt and sliced garlic to fully enjoy its flavor. Having these steaks sure made my weekend staycation a lot more special. And I'm so happy that these steaks are now available in S&R! Distribution is still limited to a handful of branches, namely S&R Fort, Shaw, Alabang, Aseana, Congressional (Quezon City), San Fernando Pampanga, and Dau Pampanga. But it will soon be distributed nationwide.